How many ways are there to bake hamantashen? Probably more than you think. Plus kreplach and a host of other delicious Purim recipes. As the day that celebrates the salvation of the physical existence of the Jewish people, Purim is the most physical of the festivals. Its observances include giving gifts of money to the poor, sending food portions to friends, and eating a sumptuous meal accompanied by plentiful drink in the closing hours of the festival. Hamantashen and kreplach, both with their fillings hidden inside, allude to the hidden nature of the Purim miracle. 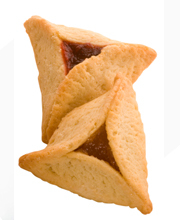 On a lighter note, the three-pointed hamantashen are said to evoke Haman’s three-pointed hat or his triangular ears. In addition to recipes for these two Purim traditions, we have included a number of recipes you can use for the Purim feast. I would like to receive news and updates from Chabad of Rural and Regional Australia by email. Okay, I am going to give this a try! My bubbie (I am one now-i.e., grandmother) made a flat apple pie on a cookie sheet. It was a cross between a cookie & strudel dough, and it was sliced and eaten by hand. Does anyone have such a recipe. I would very much appreciate a recipe I could use. Kosher Cream Cheese in Canada? YES !!! I am replying to Janice Barley's comment about Philadelphia Cream Cheese. I'm not sure why the comments are from previous years but I wanted to inform the readers that there are many Kosher Cream Cheese products sold in Toronto. I am not Jewish but I often purchase Kosher Products, including Chicken, because I prefer the taste and know that they are "clean". yeast hamentashen Ii am searching for the old-fashioned South African recipe for yeast Hamentashen with Poppy seed (mon) filling or cheese filling. Does anybody have the recipe and also, I live in Canada so what cheese would you use for the filling as Philadelphia cream cheese just doesn't cut it. Thank You! For these beautiful recipes! Remember It is so nice to see our religion and its customs on the web, such a modern vehicle for recognition and remembrances!